In 2014 the District of Columbia and the following states impose their own separate estate tax in addition to the federal estate tax - Connecticut, Delaware, Hawaii, Illinois, Maine, Maryland, Massachusetts, Minnesota, New Jersey, New York, Oregon, Rhode Island, Tennessee, Vermont, and Washington. In many of these states, there is a significant "gap" between the value of the federal estate tax exemption and the value of the state estate tax exemption. For married couples who live in these states, the gap can result in a state estate tax being due when the first spouse dies even though no federal estate tax will be due until after the second spouse's death. For a chart showing past and present state estate tax information, refer to the State Estate Tax and Exemption Chart. What is the State Estate Tax Exemption Gap? The state estate tax exemption gap refers to the difference between a state's estate tax exemption and the federal estate tax exemption. For example, while the 2014 federal estate tax exemption was $5,340,000, the 2014 Maine exemption was only $2,000,000, which leaves a "gap" of $3,340,000 between the two exemptions. In Massachusetts, the 2014 estate tax exemption was only $1,000,000, so the gap was a whopping $4,340,000. How Can the State Estate Tax Exemption Gap Affect an Estate Plan? 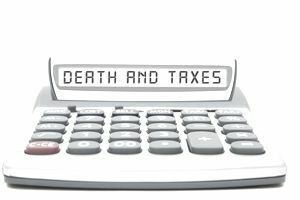 Married couples who live in the District of Columbia or one of the states listed above may have a state estate tax problem when the first spouse dies. Why? Because the typical estate plan for married couples will include AB Trusts which are designed to maximize the use of the federal estate tax exemptions of both spouses. If properly structured, AB Trust planning allows married couples to pass on $10,680,000 free from federal estate taxes. But the problem for married couples who live in D.C. or one of the states listed above is that AB Trust planning has nothing to do with minimizing state estate taxes. This problem is exacerbated by the introduction of "portability of the federal estate tax exemption" between married couples for deaths that occur in 2011 or later years. For example, if the estate plan of a Massachusetts couple was written many years ago to solely maximize the use of both spouses' federal estate tax exemptions (such as in 1997, when the federal estate tax exemption was only $600,000) and one of the spouses dies in 2014, then the first $5,340,000 of the estate of the deceased spouse will go into the B Trust. But since the Massachusetts estate tax exemption is only $1,000,000, $4,340,000 of the B Trust will be subject to Massachusetts estate taxes. This will definitely be a surprise to the surviving spouse who was told years ago when the estate plan was drafted that estate taxes would only be due and payable after both spouses are gone. What if the estate plan of the Massachusetts couple does not include AB Trust planning because the couple wants to rely on portability of the federal estate tax exemption? Then, assuming that the surviving spouse takes all steps necessary to elect portability, then the couple will be able to pass on $10,680,000 (if both died in 2014) free from federal estate taxes. But what about Massachusetts estate taxes? By foregoing any type of state estate tax planning, the couple will only be able to pass on a measly $1,000,000 free from Massachusetts estate taxes. So what can married couples who live in one of the states where they will be subject to the state estate tax exemption gap do? Fortunately, in some of these states, there are ways to plan for both state and federal estate taxes in such a way that will defer the payment of all estate taxes until after the second spouse's death by using an "ABC Trust" system instead of typical AB Trust planning. These states include Illinois, Maine, Maryland, Massachusetts, Ohio (through 2012, since Ohio's estate tax was repealed on January 1, 2013), Oregon, Rhode Island, Tennessee, and Washington. It may also be possible to use ABC Trust planning in Vermont, but please consult with a Vermont estate planning attorney to be sure. But what about states where ABC Trust planning is not possible? Then in these states married couples will still need to include AB Trust planning in their estate plans and then the surviving spouse will need to choose between paying a state estate tax after the first spouse's death or under-funding the B Trust and making the portability election so that both state and federal estate taxes will be deferred until after the surviving spouse's death. Finally, note that in most of the state that collect a state estate tax AB Trust planning or ABC Trust planning is necessary for married couples in order to maximize use of the state estate tax exemption of each spouse since to date only Hawaii recognizes portability of its state estate tax exemption and Maryland will recognize portability but not until 2018.